magayo WET software is visually appealing, delightfully flexible and fun! 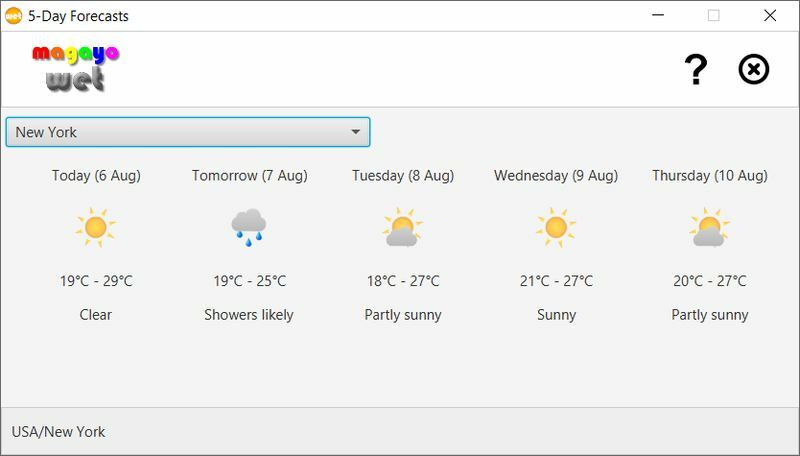 It is the best, free weather app with animated weather icons, currency exchange rates and world time for your Windows desktop, whether at home or at work. magayo WET displays the local date & time of your chosen cities, the local weather with animated icons and the currency exchange rates. It also provides 5-day weather forecasts, the historical currency exchange rates, time converter, currency converter and temperature converter. You can further configure and personalize the look and feel of every element for every location displayed. 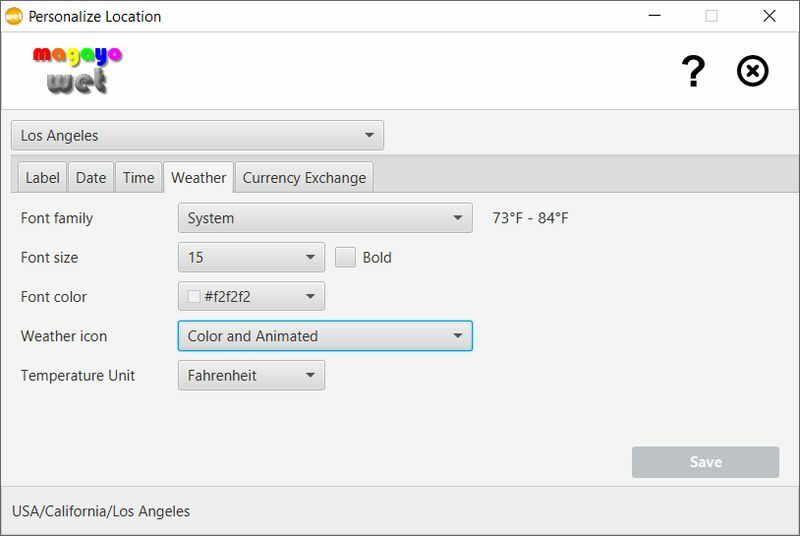 You can easily change the font family, font size, font color, date format, time format, weather icon style, temperature unit, the currency to convert to and the amount to convert to. Download magayo WET software now! magayo WET software provides 5-day weather forecasts for the locations displayed. 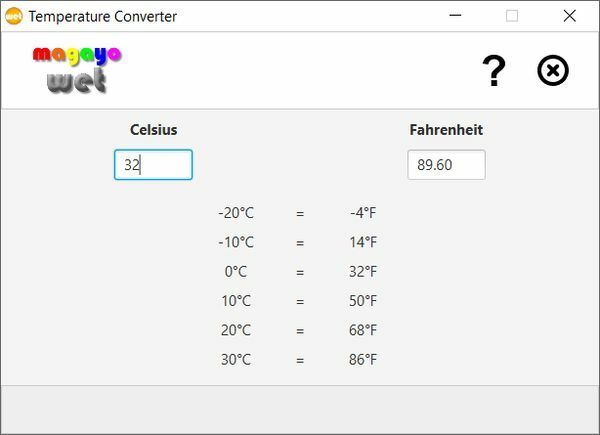 A temperature converter is also included for your ease of conversion between Celsius and Fahrenheit. 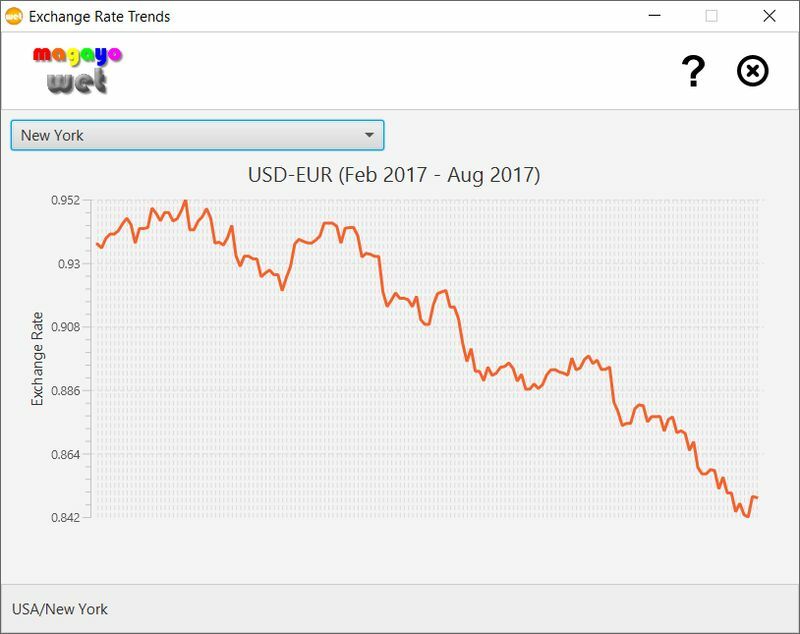 Besides showing the currency exchange rate for each location displayed on your Windows desktop, you can further view the historical currency exchange rates for the last 6 months. 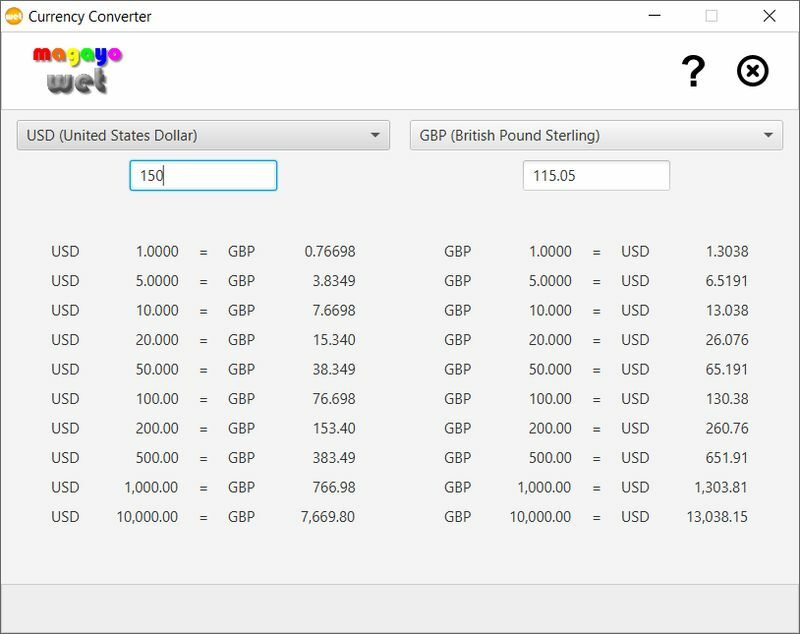 You can also easily convert any amount from one currency to another currency with the currency converter. 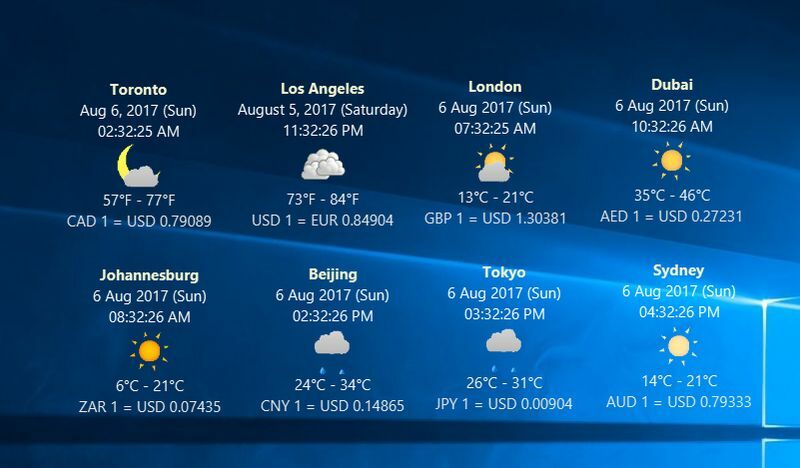 The local date and time of the city is shown for each location on your Windows desktop. 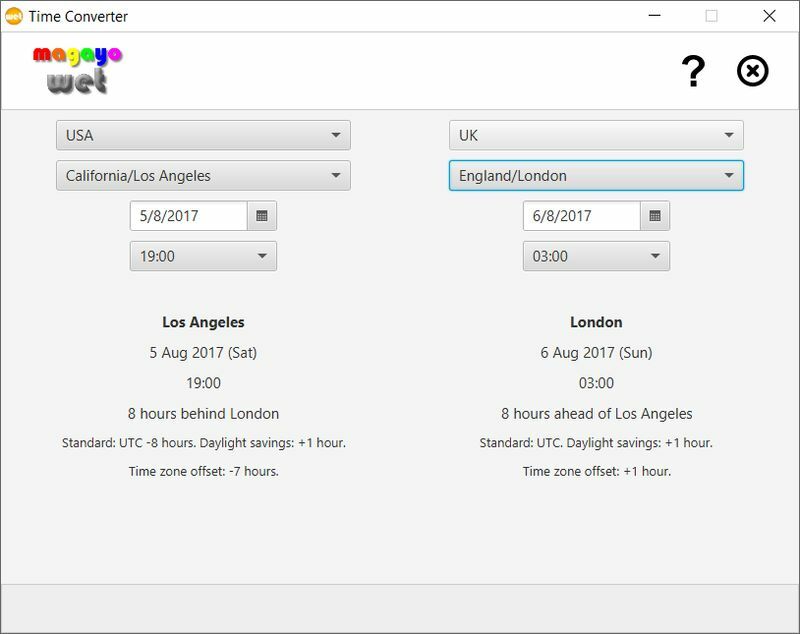 With the time converter, you can also readily tell the time in one city based on the local date and time of another city. Multiple users sharing and using the same Windows computer can set up and personalize their own locations to be shown in their Windows desktop. Get magayo WET for your Windows desktop! magayo WET is FREE and 100% clean.